'09 was not a banner year for our cannine compound. Both Lady Belle and Swift journyed across the Rainbow Bridge to the spirit world. This left a huge void in our lives, having had cannine companionship since we got together three and a half decades ago. The passing of a pet is no small matter with those who have found companionship, bullet proof friendship and an indepth connection with another fellow traveler in this world. They bring a purity and innocense to the relationship. Their honesty is uncompromising. Their trust, once earned, is insoluable. Not all dogs fare so well. It is common that the human/cannine connection is not always a happy one. There are cases that straddle the line. Such was the relationship with Miss Swift. She was pretty with a strong build. But she had issues. Issues that would in time, cause her untimely passing. Despite her flaws she was a fabulous dog. She was very, very bright, quick and savy. She was my bikin' buddy. Her need to be worked blended well with my need to spin wheels. We spent countless hours in the woods. Sometimes we wouldn't ride at all. We might just hang out. We surmise that somewhere in her history she was treated poorly. For whatever reasons, she never would trust anyone completely. She had many friends, even though she had bitten most of them. It was her aggressive behavior towards children that we never were able to alter. One day she chased the neighbor kid into their yard and bit him. As I drove home that evening, the neighbor lady gave me a strong stink eye. "Humm," I wondered, "what's that all about?" I soon found out. Tanya and I both knew what was to transpire from this incident. The next morning I took Miss Swift to the vet's. Emotion welled up. Who was I to be God and inflict the death penalty on this beautiful, if not flawed creature? Like, I'm so perfect? The excecution didn't go well. The young vet had trouble finding the vein. It took seemingly, forever. Finally it was over. I was an emotional mess. I took her to Calistoga and hiked up the Oat Hill, to the area where she found joy. I sobbed as I prepared her resting place. For the next few months Lady Belle had run of the roost. She no longer would have to tolerate sharing the love, affection and food with anyone. She was the Queen once more. Yet she was growing old. Her age and lifestyle was about to catch up with her. One of her favorite activities, when we were not looking, was to venture to the Chinese restaurant and eat heaven-knows-what! She had been sighted many times crossing the busy and hazardous highway 29 to graciously accept handouts from compassionate patrons at the motel. We suspected that she was getting more calories than we were feeding her when she weighted in at the vet's. She managed to put 15 extra pounds on her petite frame. In December on a rainy night, she didn't come in the house or curl up on her favorite sofa on the back porch. She appeared the next moring cold, confused and weak. We put her on the sofa and put a blanket over her. But she seemed to be losing strength. In a few hours she would pass in the arms of Austin. Her reign covered a most notable period of our household. She came from a box of puppies that appeared at a high school soccer game. She watched the boys go to school. Yet her greatest achievment was to sheppard Tanya through the valley of tough times. She was the touchstone of sanity when life simply spun out of control. Her unswerving loyaty and vigilence anchored our storm tossed, little freighter. She helped us wait until the skies again parted and light again shone upon our path. Suddenly we were without a dog. For me it was OK. But for Tanya she had a hole in her heart that was hemoreging badly. 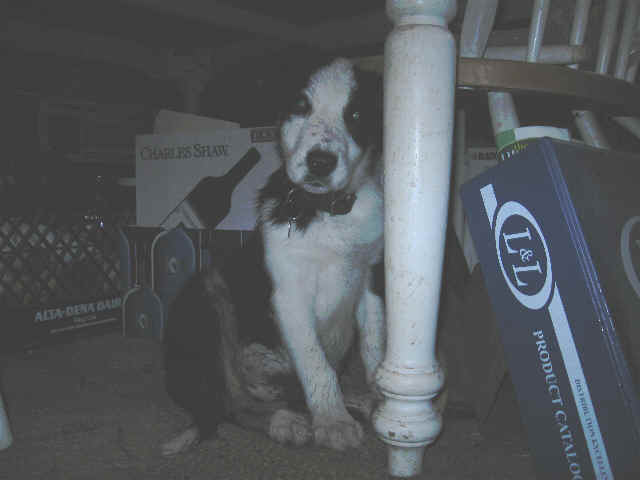 Within days word came of a litter of Border collie/mix puppies. 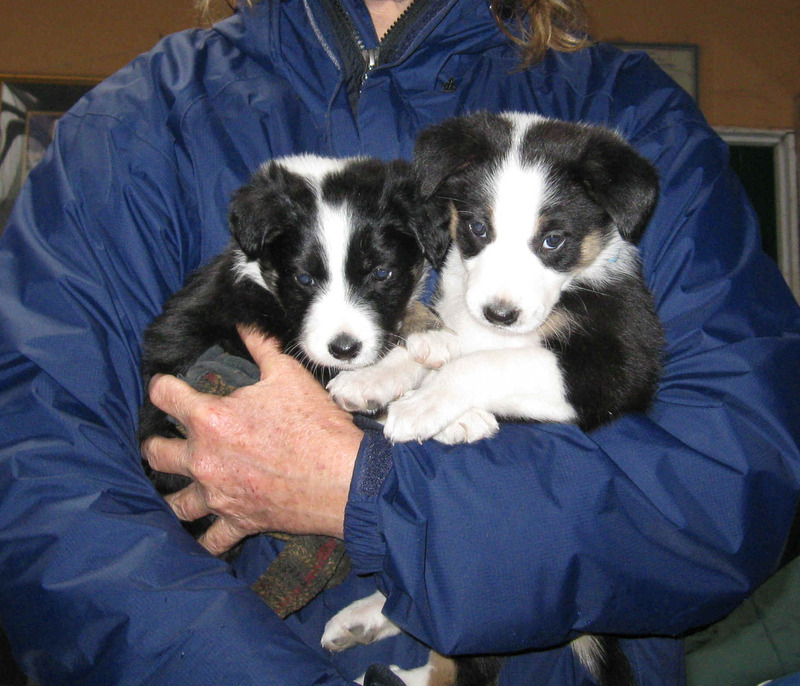 Despite their being only five weeks old, a double puppy patch was applied to Tanya's heart. For the next several months Sally hung out with me and Sophie went with Tanya. Sally and I did some mountain bike rides despite her very young age. She proved immediately to be trail wise and fast. I never took her on any long rides. She needed to grow into those events. Occasionally Sophie joined the rides. She was stronger and faster than Sally. She was fit, trim and gorgeous. The months passed. Winter gave way to spring, summer had a full menu of activities and soon the fall was upon us. For the first time in years, Tanya and I planned a significant trip together. For the past decade we've mostly taken separate vacations in part because of the animals and the on-going life that is our home. This was finally a trip for us. We vacilated on which, if any animals to bring along. Finally we felt we wanted to take the whole family (minus the bird). We packed our camping gear, food and Sophie and Sally and hit the road. We traveled east on Hy. 20 into the Sierra Nevada. The fall colors were just beginning. The miles past with ease. We stopped along the Truckee River and had a liesurely lunch. We tossed sticks for the dogs to fetch from the river. We drove all afternoon across Highway 50 in Nevada, dubbed the "Lonliest Highway". Its stark emptyness offers a sense of freedom, the removal of all of life as we typically know it. There is very little in the way of human's evidence. Miles and miles of sagebrush and sand allow the eye and mind to experience a place that is untrammeled, open and natural. We drove into the night. Our first challenge was to find a place for the night. I need a place where I feel relatively safe. Campgrounds are good, they're legal. The nearest campground was probably 150 miles away. We would have to wing it for the night. As luck would have it we found a geological site with picnic tables and a shelter. The shelter was not needed. The desert sky was so clear it was captivating. It was impossible to not stare at the Milky Way. The stars were no less than awesome. The first night sleeping was not perfect for me. We pitched the tent on the concrete. It was hard and cold, a challenge for the camping pads. There was an interesting feature to the night. It was nearly soundless. Only on occasion could we hear anything, usually a distant automobile. I watched the big dipper turn ninety degrees through the night. Finally the first light of our second day appeared. We arose, made coffee and got on the road early. The first part of the day saw us driving across relatively ho-hum scenery. Eastern Nevada and western Utah are mostly flat. We drove with a sense of vacation, ease and comfort. The miles sailed past as we drove under blue sky and mild temperature. We left the freeway near Moab and drove to Arches National Monument. There nature has done a phenominal job of sculpting the sandstone into dozens of statues and arches. It was a target rich environment for the camera. Arches National Monument in front of the "three gosips"
It was mid afternoon when we left the Moab area. We drove the scenic route along the Colorado river. The waterway was nestled in a colorful canyon for most of the way towards I-70. We drove with some urgency toward Glenwood Springs. As we calculated the time, we figured we might have just enough daylight to be able to hike up to Hanging Lake. This is a wonderful feature located in Glenwood canyon that was built by the WPA in the '30's. It is just over a mile of hiking up a steep canyon. The small lake is turquoise blue and fed by a pretty waterfall. However darkness won and we had to turn back before getting to the lake. None the less, the hike was a nice break from all of the driving. It gave the puppies a chance to get out and romp in the woods. They dashed ahead on the trail, then returned to make sure we were still there. They chased sticks and splashed though the stream that bordered the trail. 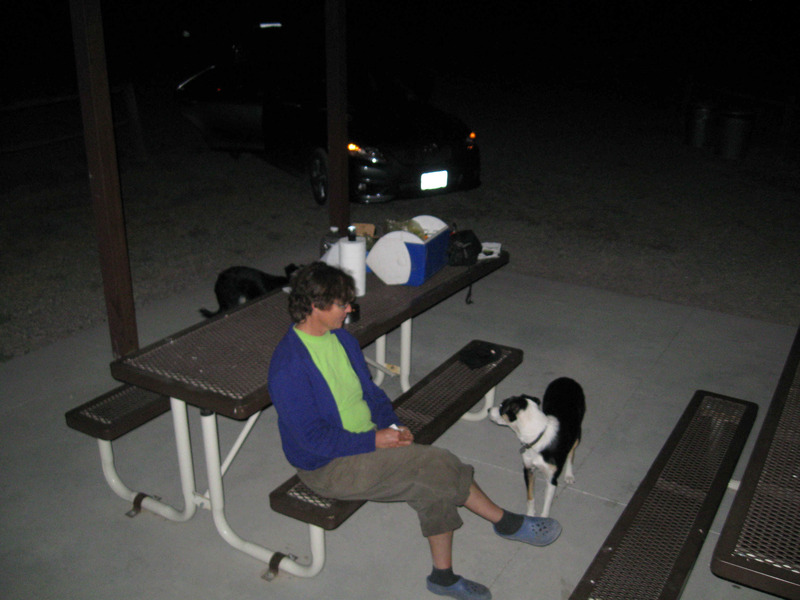 We had dinner at the trailhead. There was a nice area with picnic tables that served us well. So well in fact, that we considered spending the night. There were no signs that specifically outlawed camping. We knew that camping is not typically allowed at rest areas so we pressed on. Our goal became Camp One Shoe, a place I had used many years before. It was high in the mountains between Minturn and Leadville. It was dark when we arrived only to find that it was closed. Now we were in a minor fix. It was late, we were tired and didn't know where we would find that safe place. Luckily we found another National Forest campground. This one was open. 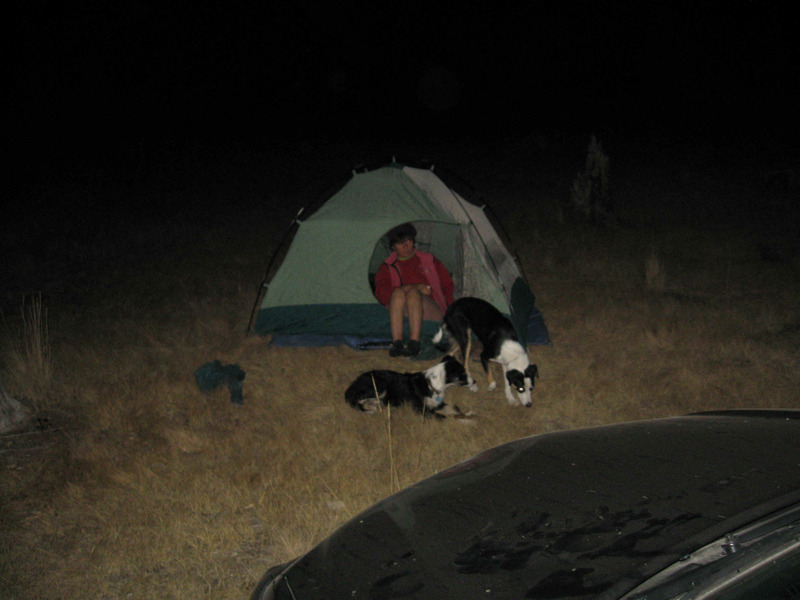 We hastily set up the tent, housed the dogs in the car and went to sleep. Tanya was first up in the morning. There was frost on the ground. She made coffee while the dogs sniffed around the area. The sky initially, was clear. But shortly after getting on the road a deck of clouds covered the higher peaks. We drove a loop through Leadville, past Climax and reconnected with I-70. We elected to take the highway over Loveland Pass. This route is spectacular. The sky had cleared and the visibility was unlimited. We drove through Denver with little hassle. The traffic was not bad and the road was clear. We took I-76 northeast towards I-80 and points beyond. The days was beautiful and we made good time. We stopped at a rest stop in Nebraska and had lunch. I tossed the tennis ball for the dogs. We seemed to have a slight headwind. We drove all day and into the evening before getting our one and only motel room for the night. In the morning we had motel coffee and pastry. It was pretty bad but served the purpose. We motored in near perfect conditions toward Iowa. We passed huge wind farms. The giant wind turbines dotted the landscapes. At West Branch we exited the freeway and pulled into Scattergood, Tanya's high school. Our trip to this point had been great. In an unforgetable moment that all changed. By virture of the sort of alignments that the universe can offer, Sophie managed to align herself with a fast moving pick up truck. She was not killed outright. We went to the local vet who indicated some, but little hope. Tanya could not let go if there was any hope. We were on a schedule. We left Sophie in the competent hands of the veteranian and continued toward Pennsylvania to meet with my brothers and Tanya's brother who was by happenstance trucking through the area. Family resting place in Penna. Brother Walter drove from Vermont and met us at Karl's place in central PA. We spent a pleasant weekend with the various family members. The weather cooperated for the most part by providing beautiful days and warm temperatures. The great weather turned to cloudy and light rain. This was greeted by us as welcome. Rain is very rare in California during the summer. The soft, gray sky nurtured our sad emotions and seemed to be just the right offering for a pleasant drive in the mountains with our friend Paul Weeden. He guided us through awesomely beautiful Pennsylvania Game Lands. The fall colors were just beginning to hint at the coming display. The lush green countryside was a welcome respite from the hot, searing desert that is most of California. Tanya's brother Jay and his partner Vicky happened to be delivering apples from Washington State. This seemed odd since Pennsylvania is a large producer of apples also. Luck in timing was with us as he was able to spend a little time with us. We went out for pizza in the tiny town of Port Matilda. We talked and comisserated about our pets. Jay is one family member we get to see from time to time as he motors from coast to coast in his 18 wheeler. Jay and Vicky spent an afternoon at the Troutville property, which was the genesis of our trip east. Finally we journeyed from visiting with family and old friends to the Troutville property. The land has been in Tanya's family for four generations. Now owned by six different people, it is unlikely to go anywhere soon. The land is undeveloped and hosts a small cabin built by Tanya's dad nearly forty years ago. 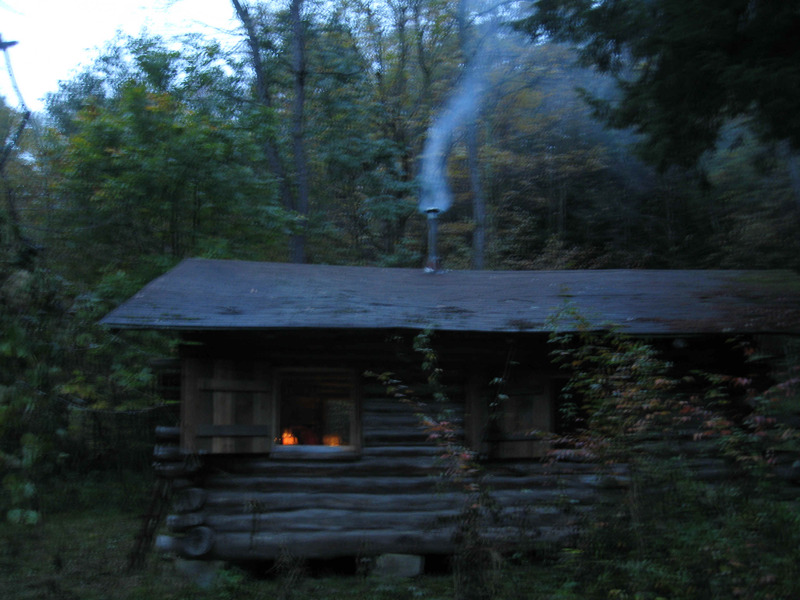 The cabin is still in good shape in part due to a a handful of people who use the facility on occasion for hunting. We spent a very peaceful night at the cabin. We had dinner and simply sat around the woodstove, talked and enjoyed the quietude. We talked little of Sophie though we both had her constantly on our minds. The next phase of our journey was to hook up with our friend Scott in Ohiopyle PA. This small town is internationally known for being a great place to paddle white water. Scott has been there for over thirty years. The drive was pleasant. We enjoyed the PA scenery, nice roads and a mild, cloudy day. We arrived in Ohiopyle late in the afternoon. Scott took us on a brief tour of the small burg. Not only is the rafting and kayaking great, but there is also a monumental Rails to Trails route that passes right through town, over a monsterous bridge and all the way to Washington D.C.
Scott cooked a delightful meal. We sat around for several hours before retiring. In the morning Scott took me on an extended bike ride. We rode several trails including the Oriole Trail. Tanya took Sally for a nice long walk. By mid afternoon we were ready to head west. In talks with the veteranarian we learned that they had finished with any proceedures that were going to be done on Sophie. We decided to pick her up on Friday instead of waiting until Monday. We drove well into the evening, past Chicago and into Iowa. We found a nice park to spend the night. We were up early. Tanya made coffee while I lounged in the sack for a while longer. We drove straight to West Branch arriving a little after 10 in the morning. It was our hope that Sophie would rally to see us. We felt terrible that we had ditched her after the accident. Perhaps when she needed us most, we split. She was weak. It was obvious to a neutral observer that she was dying. We still thought that if we got her home, she would respond. She would be in familiar surroundings, loved and cared for. We left West Branch just before noon. The rental car never cooled off for the next 28 hours. Nature smiled upon us with near perfect weather. The temperature was mild and the winds were light. The car performed flawlessly and had a good range of nearly 500 miles. We stopped only for gas. We drove straight through the night, taking turns sleeping. Now that we are empty nesters, we find we have plenty of love and affection for our pets. We actually were not aware of how invested we were with our gals. This is one of life's axioms: "You don't know what you have until it is gone." At this point she wasn't gone. There was still a glimmer of hope, and "where's there is hope, there is life". Each in our own way knew the situation was heavy. It weighed the hopes and aspirations of this fledgling, beautiful and talented dog with the coarse hand of fate, of timing so odd, of a split second that separated this young, bright life with a journey across the rainbow bridge. An unintended consequence of this tragedy is that it gave Tanya and I a common mission, a focal point for our immediate life. It heraleded in a period of deep introspection, reflection and thoughts on a more grand scale of this existence. The addition of I-80 at 75 miles per hour added a physical and optical component that sent the journey into interstellar overdrive. On Saturday afternoon we pulled into our driveway. It was a far cry from the relaxed vacation that we had envisioned. We carried Sophie into Tanya's bed. She was not comfortable. At one point with help, she got up and went outside. 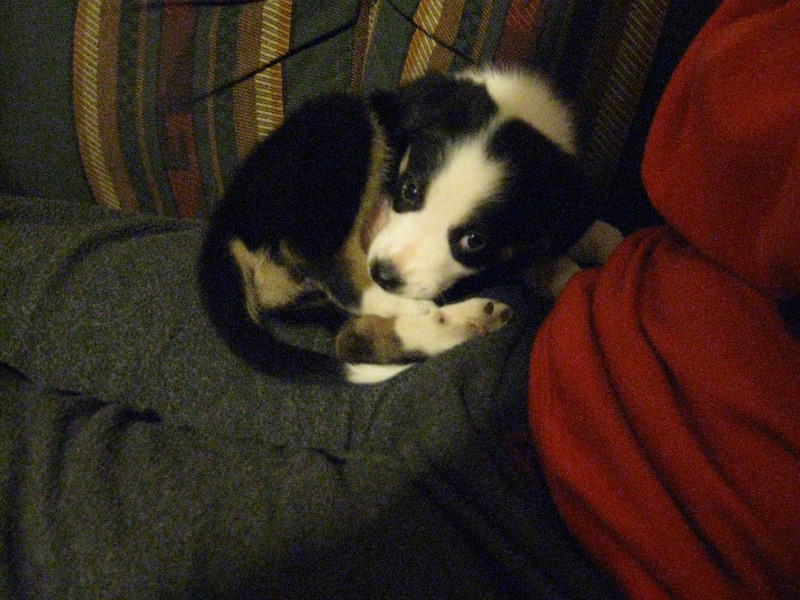 She sniffed her way around the yard and nursery on wobbly legs. Then she crawled under a low display of flowers. In retrospect I think this was the place she was choosing to undertake her journey to the spirit world. We got her back into the house and comfortably in bed. Sunday morning we changed her dressing. We both didn't like what we saw. We gave her pain medicine and she rested fitfully throughout the afternoon. But into the evening her breathing labored, she became restless and finally around 7:00 she slipped away. It didn't seem possible. She was too nice. With crushed hearts we buried her near Belle in our redwood grove. It was a sad day. In fact it was several sad days. The TTT (time to tears) factor was still in the instanteous zone. Two weeks passed and Tanya wasn't getting much better. She had a difficult time not thinking about her beloved Sophie. Extrodinary measures needed to be taken to shake the weight of the grief. It came thundering into our life in the furry form of Tor. A newphew of Sophie and Sally, his looks are more similar to Sophie. He came into our home at the age of 4 months. He has had just enough time to develop some power. He will never replace his aunt, but he has successfully plugged the big hole in Tanya's heart.